Some time ago I read a book entitled “Les femmes qui lisent sont dangereuses” (roughly in English: “Women that read are dangerous”) by L. Adler and S. Bollmann. It is a beautiful art book showing paintings of women while reading and thus retracing the history of the female access to reading, books and education. This book inspired me to create my own take of a woman reading. My scientific leanings have given the story a further twist. Women that read can be indeed dangerous. Even so much as to warp and bend the curvature of spacetime! By pure coincidence (but that’s the beauty of it, right? ), when I was working on this personal project, we were just about to celebrate the 100th anniversary of Einstein’s publication on relativity! 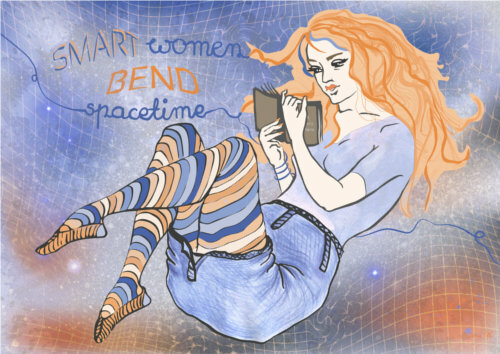 Smart women bend spacetime! And that’s a fact! If you like it, you can purchase it as a limited series of art prints, posters or postcards shipped from Germany or art prints and other items like phone cases and laptop skins shipped from US. Huge thanks in advance!